Blogging will be light in the next few days...do to my involvement with Buffalo Old Home Week. If you haven't registered yet...you should do so. It's free! First visited 905 Humboldt near East Utica, May 2005. Earlier this week I noticed some substantial work happening at this location [google map]. There's nothing new on the City's site regarding ownership at 905 Humboldt since the 66K foreclosure two years ago. This entire neighborhood around East Utica and Humboldt has some amazing homes. Check out this post about a few of them - right here. One of the most complex stories emerging in this week's Buffalo News is on-going and seemingly inevitable story of another round of church closings. Especially hard hit in this second round of closings - is the City's East side. Still no plans to sell the big house! The first article includes Council President David Franczyk's "ethnic cleansing" resolution that was unanimously passed by the Common Council. The second article - appearing in today's Buffalo News with the diocesan "outrage (yawn) and response" is also archived. David Franczyk was on the WBEN Tom Bauerle show this morning - here's a 12 minute clip, David Franczyk. Kevin Keenen, Diocesan talking head responds, right here. Remember the first wave of closings was in the mid 90's with Transfiguration (falling down), St. Matthew's (flipped), Our Lady of Lourdes (closed), St. Lukes (saved), St. Mary's (saved) and St. Benedict the Moor (demolished). St. Frances de Sales (in transition). Remember this? The height of Catholic Buffalo, 1947 - right here! And while Bishop Kmiec closes City Churches, he's built one, right here - Inside our newest McChurch! Rode by 91 Northampton this morning and nearly fell off my bike. Someone is spending a ton of cash on this totally distressed property that I thought for sure was headed off to the land-fill. It's been like totally derelict and neglected as far back as I recall. 91 is directly across the street from this amazingly beautiful home and just a block from Artspace. Remember 38 Northampton was sold in less than 30 days - list to sale. 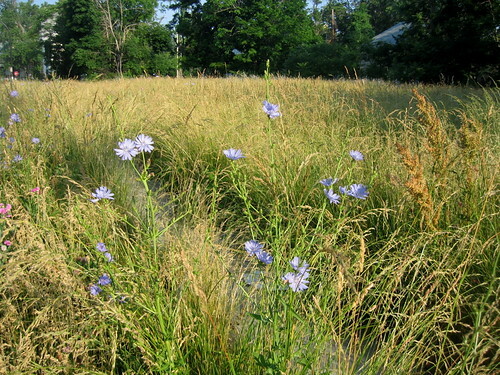 Urban Prairie - Pic of the Week! Rode through the urban prairie this morning on the way downtown. This spot is on Southampton Street, one block from Artspace! If you didn't notice the stop sign - far left - you might think you were on a country road near Springville, NY. Here's the aerial pic - our Shrinking City - of the area that MJ grabbed earlier this year. Hard to believe that this is only a block from Main Street. Here's another view, looking slightly to the left. It was only a year ago that the Ciminelli LP crews broke ground on the future permanent home of Performing Arts HS. Remember Day 1? Here's a slide show - BAVPA One Year! - of what I saw earlier this evening while walking around the site. All sorts of finishing work has begun and most of the architectural glass has been installed. Very cool new Art and Science wings...and the new front entrance along East Ferry Street is equally amazing. Understand that it's a new gallery space. Work has kicked into warp speed as crews prepare for the arrival of Performing Arts this September! 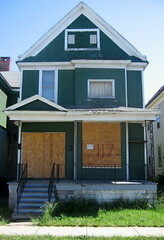 Just saw this on National Vacant Properties Campaign site - Shrinking Cleveland - a few weeks too late, sorry. Wrote about the Shrinking Cities project as it criss-crossed the country earlier this year. Here - Detroit and in Berkeley. So if Cleveland could host this, why not Buffalo, NY? We're shrinking at a faster rate than Cleveland! 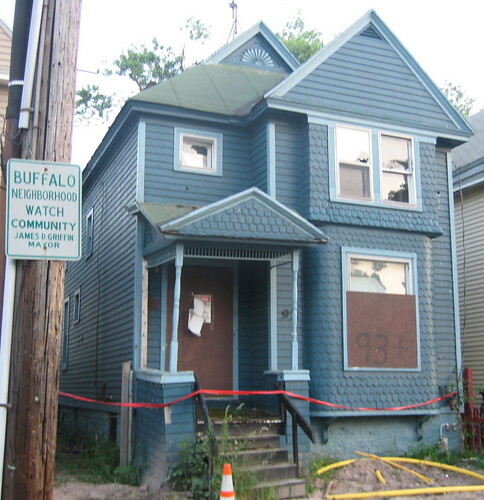 Wrote about Cleveland, OH in few recent posts - Cleveland's Housing Court - a September 2006 visit by Housing Court Judge Henry Nowak, Building Inspector Tracy Krug and Housing Activist Michele Johnson. 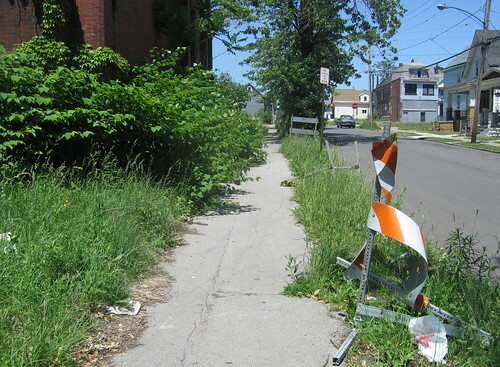 Cleveland in Decline, focuses on a recently released movie and documents some of the structural issues that have to be addressed on the urban prairie in Cleveland. I know. Perhaps it's too much for Byron to handle. Especially considering the denial that's going on over here in Sickamore Village. 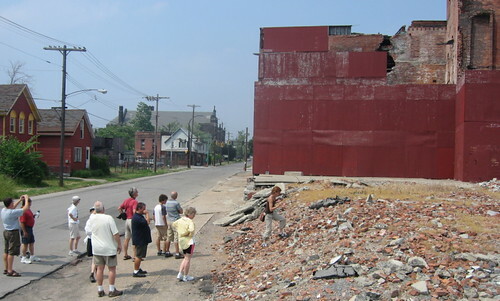 See also - Getting Smarter about Decline...includes links to Blueprint Buffalo. For those of interested in issues involving "brownfield reclamation" see Learning from Others. 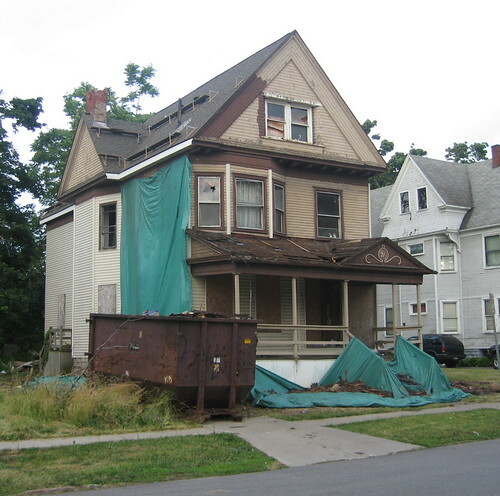 Make sure to check out LISC - Buffalo and National Vacant Properties Campaign for addtional information regarding issues and major public policy initiatives involving abandondment, vacancy and the management of decline. This is Virginia Street, the only street that crosses Main Street and doesn't change names! 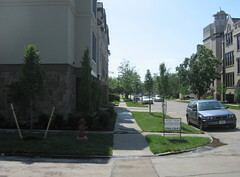 Wrote about this townhouse development recently - Fruitbelt News - in April and last Saturday checked out the progress Rev. Chapman and the St. John Baptist Church is making in the Fruitbelt. Innovation is now viewed as America's economic salvation. Every urban leader is trying to figure out how to get more of it. And they couldn't find a better adviser than Richard Lester. As founding director of the Industrial Performance Center at MIT, Richard has led major studies of regional innovation performance and he co-authored Innovation - The Missing Dimension on sources of creativity and innovation. Also with us is innovator and serial entrepreneur Robin Chase, founder of ZipCar. Today, the hourly rental service has 50,000 users in 10 cities. With her latest company, GoLoco, Robin hopes to jumpstart ride sharing in America. Received dozens of faxes, emails and phone calls this morning about a story breaking in Business First. 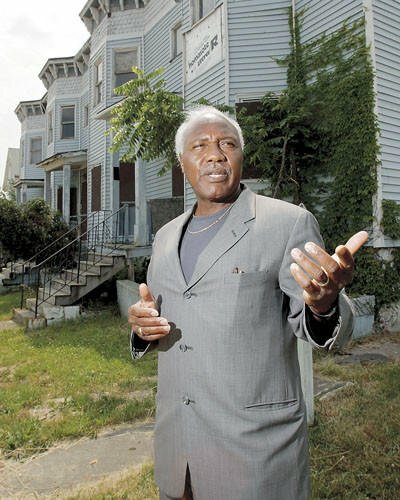 Jim Pitts, former Buffalo common council member and Executive Director of Norstar has announced his intentions and desire to buy and rehab the most neglected City of Buffalo owned historic local landmark, the Woodlawn Row Houses. fixBuffalo readers already know that this set of row houses sits diagonally across from the front door of the new Performing Arts HS, ready to open this September [map]. "This," he said while walking down Woodlawn Avenue, "Is my hometown." Pitts also wants to build homes and encourage small business development, using the September opening of the Buffalo Academy for the Visual & Performing Arts along Woodlawn Avenue as the focal point. The $30 million school, located where Woodlawn Junior High School once stood and before that, Offermann Stadium, is designed to encourage private sector development in the surrounding neighborhood. Pitts wants to lead that charge. "Since the school's project began, we've all heard how one of the side benefits was the encouragement of neighborhood developments," Pitts said. "Well, I want this to be an example of what can happen." Very interesting...Rev. 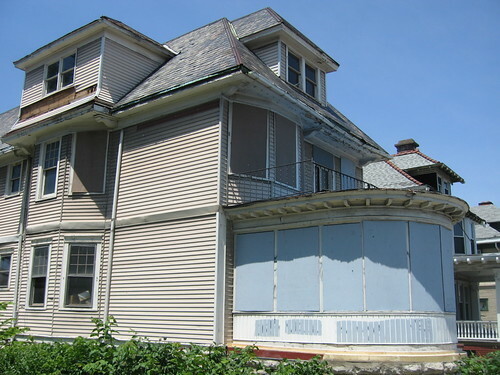 Stenhouse from Bethel CDC, one block away from the Woodlawn Row Houses, is the designated planning agency for this neighborhood and simultaneously owns the largest collection of blighted property surrounding the the new home of Performing Arts HS. Yet no mention of Rev. Stenhouse in the Business First article. I've praised Rev. Stenhouse - Getting it Done in Masten - and have weighed in with criticism - Boarding Control - over his lack of stewardship and neglect, steps away from his door. Remember he's also the Secretary/Treasurer of Buffalo's very own control board. No Housing Court Rev. Stenhouse. Ever wonder why? I'm looking forward to sitting down with Jim Pitts in the next few weeks to discuss various aspects of this project and will certainly be blogging the project's progress. Because this is Preservation Board designated local landmark, plans will be presented to the Preservation Board for review. Excellent news for the City's near East side, especially as Performing Arts HS opens in less than 75 days! 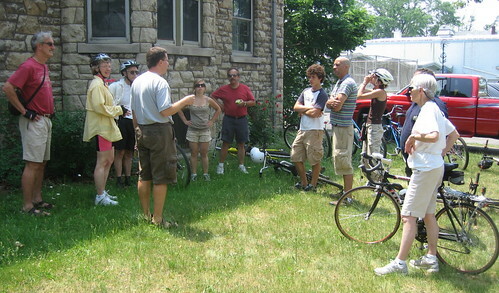 I've been archiving the "demolition by neglect" of the City owned local landmark since March 2004 - Woodlawn Row House archive - mowing the lawn, boarding and re-boarding and promoting the possible sale to two groups of out-of-town investors. Finally...thanks Jim! Front page of today's Buffalo News...the newest schools in the joint school reconstruction program are profiled. The second phase of Buffalo’s school reconstruction project is nearing completion, and it includes two spectacular elements to fuel the revival of city schools. The public investment in arts and education here in this little corner of the City's near East side is substantial - Merriweather Library 5m, Performing Arts High School 35m and Artspace 18 m...join me on Saturday mornings for a neighborhood tour! On the way downtown this morning I stopped by to check out the pedestrian bridge going up on Ellicott Street. Had heard all about design and funding issues related to this project when I got to Ulrich's last week. It's supposed to connect the UB Bioinformatics (yikes...check out the video) building and Hauptman Woodward. 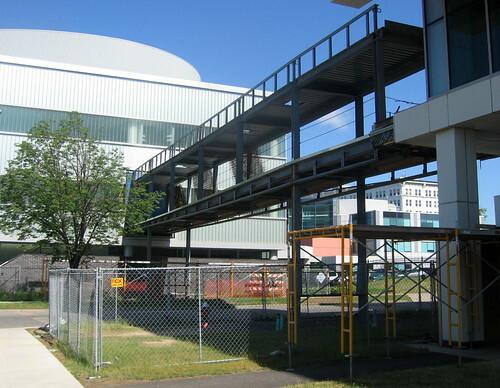 A couple people who work in both buildings told me that the pedestrian bridge was never part of the original design and where the structure connects to Hauptman Woodward, an electrical panel had to be moved to make room for the cut-out. Also learned that between the two buildings there about 6 scientists that have ID's to access both buildings. Killer is, the glass company that was supposed to install here has gone belly up...leaving the project in its current state. Twevle intrepid cyclists completed the first stage of this summer's Tour d' Neglect on Sunday afternoon. We meandered throught the City's East side - St. Vincent's, German Roman Catholic Orphan Home, Transfiguration Church and Cathederal of the Sacred Heart on Emslie near Clinton. We returned - peddling over the scar, here and through the Fruit Belt. We also had the unexpected opportunity to be joined by Sal and Tim. They provided pick-up truck back up just in case someone had bicycle repair problems. They also invited us to tour the rectory at St. Frances de Sales on Northland near Humboldt Parkway. Bruce Beyer joined us on Emslie Street and provided a unique tour of his own business and loft, here. We also had an opportunity to learn about the business that once employed 800 people - Simon Pure Brewery, right across the street from Bruce's home. Come one and join in...see the ever expanding urban prairie and places that most people thought really didn't exist, any more. Visited the Sickamore Village site this afternoon. 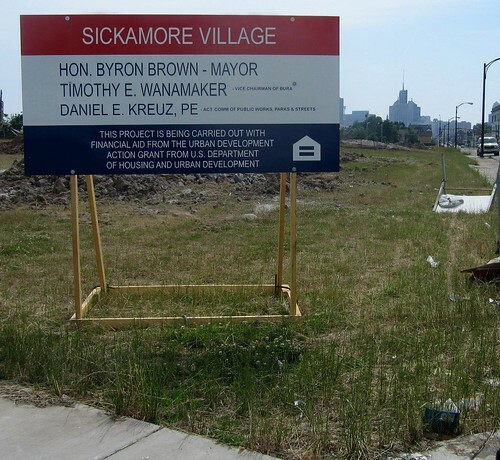 Here's the background - Sickamore Village Revisited - with pix and site plan. Kept hearing reports this week that blasting was happening here and the City was softening the site for the newest suburban development in the City limits. Blasting equipment in front of the sixth house with piles all over the site. 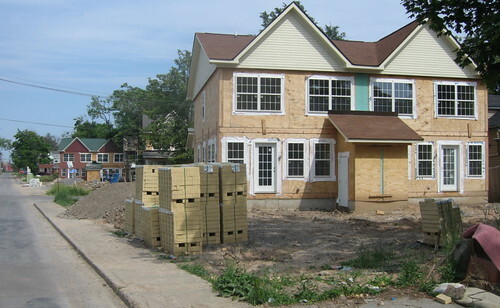 The word is that these are market rate houses starting at 200K with a planned opening later this Fall. On top of the serious design flaws - inward looking lots, fences on the street - and the fact that these will be heavily subsidized, really gotta wonder who's going to be moving in. Heard through the grapevine that there's a secret study floating around City Hall that has identified dozens of african americans living in the suburbs that want to move back to the 'hood. In the event that doesn't happen, Byron Brown was asked at a recent planning meeting - "Who's going to move in and what happens if they don't sell?" Word is that Byron scanned the room to see if there was any media and suggested that City would simply demolish them! Very interesting foreclosure information emerging on some of the heavily subsidized "vinyl victorians" just across the street from Sickamore Village on Jefferson...stay tuned. I'll be following this debacle all summer long. Artspace - 2 week countdown! This morning we had an opportunity to chat with a representative from Savarino behind the new Artspace spot on Main Street. He told us that the next two weeks were going to really tight with all sorts of finishes happening to the inside and the building's exterior. Leases are being signed and people are scheduled to move in on July 1st! City inspections are scheduled for June 25, less than a year after the groundbreaking. As you can see - click through the pix, below - new sidewalks are going in, windows are done behind the building and a few are yet to be installed in front. The new units behind the building are scheduled for occupancy on August 1st. A year ago the place looked like this - click! One of the houses that I've identified for urban homesteading was visited by the red mark of death this week. 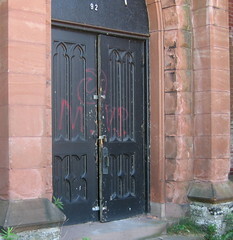 93 Riley is a short two block walk from Main Street and within the Artspace Impact area. Despite some minor roof problems and front porch issue, 93 appears to be excellent shape, structurally. The paper work on the door and the red ribbon - protecting the public from the asbestos hazard will certainly push the demolition of this house to the mid 20K range. 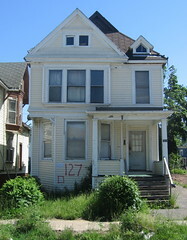 Just like this one - 125 Woodlawn - that came down for 23K a few months ago. Again, seems like this demolition money would go along way towards helping someone out with renovations. Strange, no? The Jimmy Griffin sign is still here 14 years after he left office. Any more of these still around? The first stage of this summer's Tour d' Neglect starts Sunday June 17th! We'll be leaving the Sonic Café in the 1200 block of Main Street - across from Artspace - at Noon, this Sunday. Really amazing things to see along the way. We'll be crossing this on the way back and slowly winding our way through the Fruit Belt, up Ellicott and back to the Sonic Café. Buried next to the obituary page in today's Buffalo News - Report Deplores Population Drain. A state government association released a report on New York’s demographic trends Wednesday in an effort to raise the level of urgency about the population losses suffered throughout the state. The policy brief issued by the New York State Association of Counties, an association of the state’s 62 counties, is an analysis of U.S. Census Bureau estimates released earlier this year. The numbers are sobering. 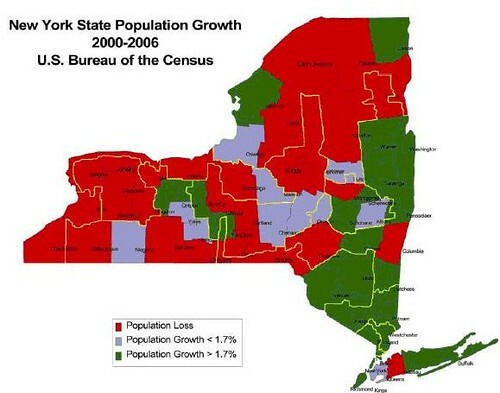 The Empire State saw its population grow just 1.7 percent since the start of the decade, compared with the national rate of 6.4 percent. Here's the link to the full report (.pdf). The Population Shuffle. Wonder if anyone in the Erie County Comptrollers office has already contacted the Dr. Warren Brown at Cornell University. From the above study on page 11. Do the math! 4800 people/year leaving Erie County. That's about 100/week, 13/day. If you're in the market UHaul is up today. I've described the "hollowing-out" of the City's East side in various ways and have documented parts of the near East side photographically. MJ's recent aerial shot clearly shows the density difference between both sides of Main Street. On Saturday I noticed that three more houses on my block - Woodlawn, between Michigan and Masten Avenues - were visted by the red mark of death this past week. When these come down, ten houses will remain on the block. Five are occupied. According to this photograph - Offermann Stadium, c. 1956 - there used to be 25 houses on my block. Some of these were 4 unit houses! Three of the remaining occupied houses are two family dwellings. Today not a single double is occupied as in upstairs and downstairs by two sets of tenants. In all cases only one of the units is occupied. When I moved here there were 18 houses and that was 11 years ago. In a few weeks there will be 10 houses on the block...directly across the street from the newly renovated Performing Arts HS. I spent a few moments walking around Transfiguration Church Sunday afternoon. As you can see by the following photos, there has been no progress made in the last three days since Bill Trezevant promised to take immediate steps to better secure the building and protect pedestrians from the falling slate. Here's a roof view from the back of the church. View along Mills Street and the non-existent perimeter fencing that was promised. And two additional views. 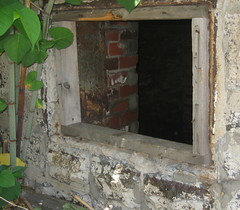 The front door is still wide open and rear basement window is not secure. 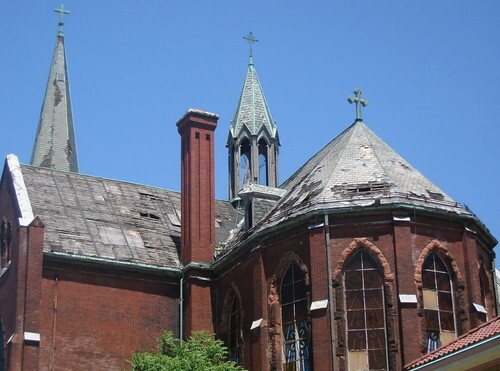 The owners of Transfiguration Church, a vacant and deteriorating East Side landmark, are under pressure from city officials to better secure the sprawling property. Here's the flickr slide show: Inside Transfiguration. The Transfiguration Church, three miles from Elmwood, was first written for Housing Court on March 13, 1997. In the last 8 years Transfiguration has journeyed through Housing Court 61 times and the file, case #869/97 has seen four seperate Housing Court judges. Judge Broderick passed the file to Judge Devlin who tossed it to Common Council President David Franczyk's brother and finally Judge Fiorella issued a warrant for Pauline Nowak [no relation to Judge Nowak] on September 25, 2002. She's an officer of Paul Francis Associates, Inc., the party that bought the crumbling church from Bishop Mansell in October, 1995. Here's that post from December 2005 - Sign of Things to Come - contains pertinent background information regarding the Dept. of Inspections attempts to nab the perp. You won't want to miss this lovely e-mail exchange between said local attorney, William Trezevant and moi. I've sat down with Bill Trezevant twice in the past few weeks. On both occasions the conversation was tense. Bill seems to be subscribing to the falacious notion that hope is still a plan. Perhaps he's just looking for the easy way out and would rather see the City demolish the church and have Paul Francis Associates Inc. billed for the major six figure demolition expense. Presumably the corporation will go belly-up and Bill Trezevant and his mother Pauline Nowak - there's still an active Housing Court warrant for her arrest - will most probably skate. 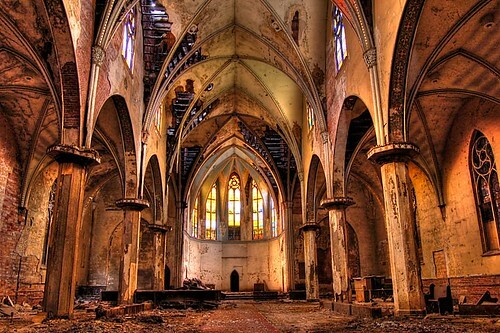 Bill has systematically stonewalled and steadfastly refuses to answer questions regarding the church, his plans and possible scenerios that could save some of the art and architectural detail that remains here, in his care. He plays the victim card and at one point while sitting down with a Preservation Board member and myself Bill refused to take responsibility for properly securing the structure. He claimed it was a matter for the corporation to consider. Also heard from a reliable source that Bill Trezevant's mother walked into Housing Court recently and walked out again, despite the active warrant for her arrest. Headed over to Sycamore and Mills, just East of Fillmore to see if he's done anything to secure the church structure since the Buffalo News article appeared more than 48 hours ago. Last Night at CEPA was able to see renderings of all the new schools. Will be posting about that shortly. Meanwhile here's the weekly fixBuffalo roof shot of the progress at Performing Arts. Noticed that some of the landscaping is being roughed in this week. A few conversations with Paul McDonnell - the Board of Education's architect for this project - revealed that additional funding is being sought for the tennis courts. These were originally part of the project and were ruled out recently as cost over-runs on the hvac system were higher than expected. 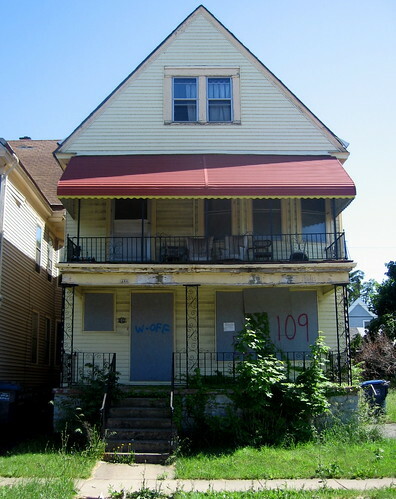 Here's the archive - Woodlawn Row Houses - to see one of Buffalo's best examples of 'demolition by neglect' of a local-landmark. After 3 years of calling this to the City's attention, the place is still wide open. Suggestions? Let me know. Religion has become a sort of battleground in America for some of the nation's most divisive issues. Buzz Thomas is attempting to cool the heat and shed light on what keeps us at odds in his new book from St. Martin's Press, Ten Things Your Minister Wants to Tell You (But Can't Because He Needs His Job). As head of the Niswonger Foundation, Buzz is also deeply involved in turning around schools in some of Tennessee's rural and most poverty stricken counties. We will also talk about reconnecting Massachusetts' gateway cities with Brookings policy director Mark Muro and MASS, Inc. president John Schneider. Prior to joining Brookings, Mark was a senior policy analyst at the Morrison Institute for Public Policy at Arizona State University, staff writer for Boston Globe, and editorial writer for the Arizona Daily Star. Before joining MASS Inc. John directed a regional planning and economic development partnership in the state's high tech corridor which facilitated public-private collaborations on sustainable development issues. 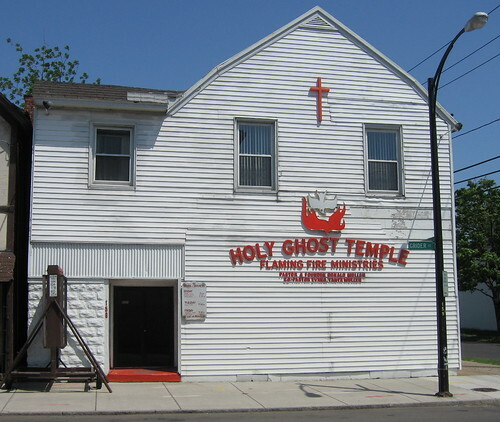 While exploring a few industrial sites in the Ferry/Utica and Grider area of the City, noticed this store front church. Still interested in the work of Camilo José Vergara (1944 - ) and recently wrote about some of my observations of City views that are inspired by his work back in April - St. Anne's & Vergarra - where I compare old, established religous structures and some newer commercial ones. Frequent fixBuffalo readers may remember a series I started two years ago. Tale of Two Cities (Part VI, with links to previous parts) - documents the developments of two properties. One property - 198 Glenwood Avenue is on the City's near East side and 60 Brantford is just off Elmwood in the most prosperous part of the City. Both properties had devestating fires. 198 Glenwood burned five years ago. 60 Brantford burned on Friday May 13th, two years ago. The property on the left is still wide open and remains a burned out shell. It's owned by the City. 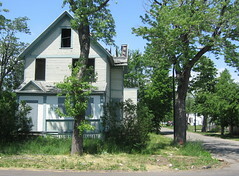 60 Brantford, on the right was promptly attended to by Councilman Joe Golembek - I followed this property through Housing Court and watched first hand how Joe advocated for his district - and demolished after the new owner Paul Johnson bought it. Same successful condo complex where Buffalo Sabres goalie Ryan Miller now lives. Meanwhile just a block away from this City owned house at 198 Glenwood, Performing Arts HS is scheduled to open in September. I've been reporting on Rev. Stenhouse's colossal lack of stewardship regarding a string of properties around the new permanent home of Performing Arts HS. He's Executive Director of Bethel Community Development - owner of said houses - and is the pastor of Bethel AME Church pictured on the right in the photo below. I've called the series - Boarding Control - as Rev. Stenhouse is also the Secretary/Treasurer of Buffalo's Fiscal Stability Authority. Most people from Buffalo call this the Control Board. I've been Rev. 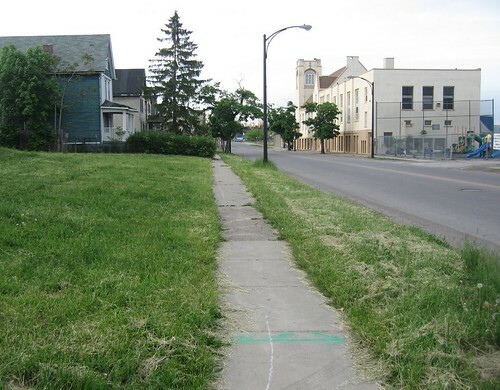 Stenhouse's lawn-boy for the past two years for this patch of the urban prarie that Bethel CDC owns. Have given up, yet just this past week a neighbor called me and told that City crews were out mowing the praire grass that was over 18" high. Wonder if Rev. 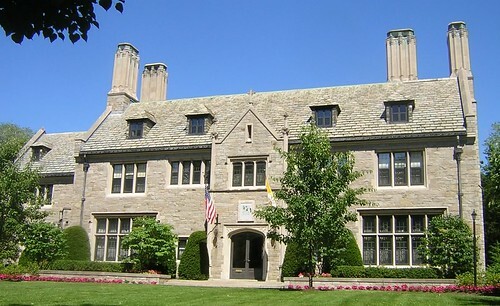 Stenhouse has the same arrangement with City crews for his own residence at 174 Jewett Parkway, just down the street from the Darwin Martin House. And yes, the houses along Michigan Avenue were still wide open this afternoon. No active Inspection Department files for Rev. Stenhouse. Ever wonder why? Here's the short film from John Paget about Queen City Farm featuring Aaron Bartley, Sheila Bass, Diane Picard, Samina Raja, Erin Sharkey, Tim Tielman, Cynthia Van Ness and more. Sean Safford has studied the decline of Rust Belt cities and found that particular kinds of social networks were key to a city's ability to renew.Saskia Sassen has studied global cities and concluded that corporate headquarters are less important to a city than are globe-trotting consultants.